It was a very long day inside the University of Illinois Armory where a co-ed track and field invitational took place. More than 55 teams congregated and did battle for well over what turned out to be a full-time workday. 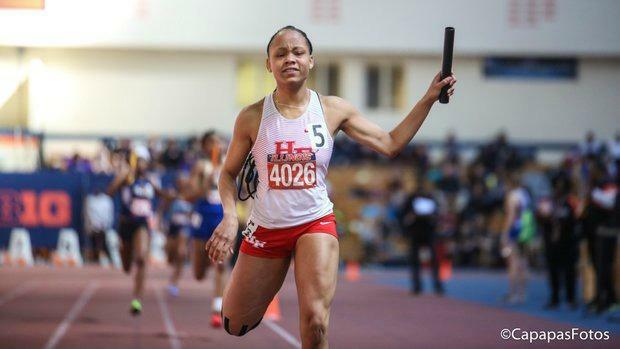 The Homewood-Flossmoor girls made their first appearances at the Gene Armer with just eight athletes. The other half of the team were back home competing locally. The Lady Vikings managed to compete well in the events they entered and take home the title with 74 points. The 4x200 and 4x400 won their races in state bests 1:43.25 and 3:59.92 respectively. It was a job well done by supporting cast mates Ashanti Denton (Jr.) took first in the 400 (58.15), Trinity Daniels (Sr.) got untracked in the triple jump hauling in second (38-3), Madison Myrick (Sr.) was second in the high jump (5-2) and fourth in the long jump (17-5.5). Bloom boys repeated as champions in easy fashion scoring 76 points over Freeburg 48 and Lane Tech 41.5. The Trojans attack was led by primarily by Kaden Turner (Jr.)- 60m champ 7.06/LJ 3rd 21-1 , Kamrin Williams (Sr.) 200m champ 22.79, Jalen Bowen (Sr.) HJ 2nd 6-2, and Samuel Raheem (Jr.) TJ 3rd 43-2.5. Serena Bolden (Sr., Springfield Southeast) made good use of the extended time to compete in three individual events and one relay. It started with the long jump where Bolden connected on her first attempt 18-11. Instead of stopping at a few rounds there was some concern that fellow jumps extraordinaire Ameia Wilson (Sr., Danville) overtaking her. Wilson, who had a full slate of events of her own, could only manage 18-6.50. What happened next really got things popping. Bolden won her 60m prelim in a new state best 7.59. Later she lowered it to 7.57. With it came the slaying of Wilson (7.68) and others. Springfield Southeast placed third in the 4x200 on the strength of Bolden who polished off the day with a tough victory in the triple jump (38-4). Kaylah McCall (Jr., Homewood-Flossmoor) came with a goal to improve on her hurdling technique and run fast. Those are obvious demands that sometimes are easier said than done. McCall breezed through the prelim round and later ran 8.66- just off of her season-best 8.61. McCall recovered from a botched leadoff 4x200r handoff that almost derailed her team's winning efforts. Finally, it was the icing on the cake for McCall and her personal best 200m in 25.43. Only Wilson's 24.85 was superior. In his second weekend in a row back from a minor injury Danville senior Quemarii Williams set the pace early and coasted his way to a meet record in the 400m with a time of 49.54. Zach Pluff (Sr., Freeburg) anchored the winning 4x200 relay that ran 1:34.87 which was a treat for the state's top high jumper who leaped to another state best 6-9.5. It was a kicker's race in the 3200m which Chicago Lane Tech senior Frank Burke-Olson took home the prize. The heavy favorite coming in was Chicago (Marist) junior Tommy Leonard who ran 9:37.05 a week before at the power charged Batavia Distance Madness. Leonard got off to a roaring start as he pulled ahead of the field from the start through the middle laps. Burke-Olson ran him down inside of the last 800 and held on 9:55.21-9:55.75. The top four finishers of the 800m ran under 2:03. 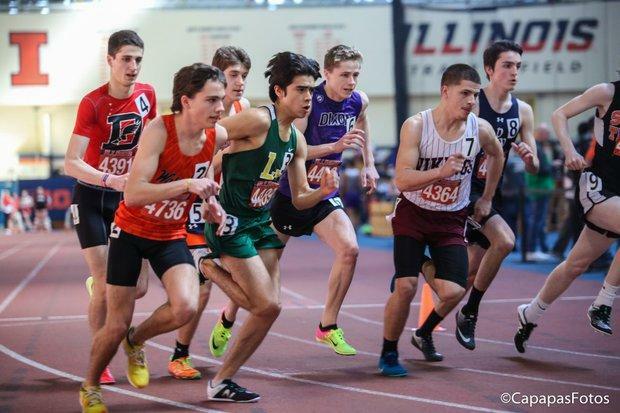 Lane Tech senior Julian Higueros led the early charge for 700m before being run down by three other competitors. Eli Ward (Jr., Waterloo) stormed home in 2:00.55. The main event featured one of the state's top distance runners in Andrew O'Keefe (Sr., Granite City). O'Keefe took from the pack just before the first half and by the 1200 (3:14), the talk was of was how fast he would run. O'Keefe hit the tape in a state-leading 4:16.69.